Although we are still waiting (and hoping) to see if we will have an Indian summer the leaves are turning red and gold, the evenings are getting longer and and the London Marathon ballot is almost here which means we are definitely in the autumn/winter race season . 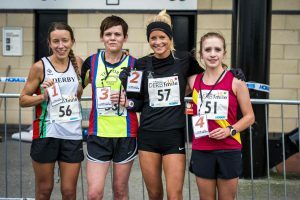 The countdown to this year’s Derby 10 is upon us with just over 7 weeks to go and we have already sold 75% of our race entries. The course is flat and fast with most of the race route being traffic free. There’s on site parking at the race start/finish, sponsor and charity stalls in the race village and musical entertainment provided by a local rock choir. The race sold out last year and even with an additional 500 entries available looks like it will sell out again. So enter now and join us on the 12th November for Derby’s only 10 mile race.